Here is our list of pesticide free herbs with growing information relating to each variety. Most varieties offered are of a commercial origin not normally available to the amateur grower. Easy and quick to grow&comma; also beautiful once in full bloom. 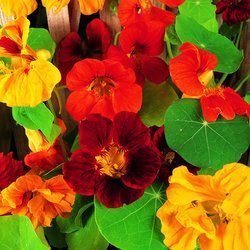 Lots of brightly coloured flowers of orange&comma; red&comma; yellows&comma; maroons and more. Use the flowers&comma; stems and peppery leaves in salads and the seeds as capers. They are known for relieving colds.